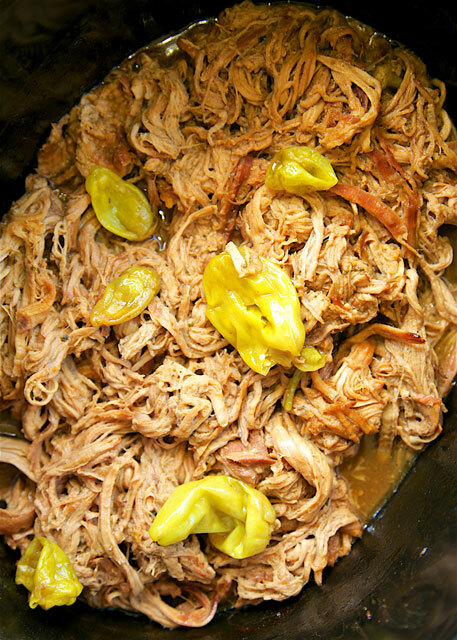 Slow Cooker Mississippi Pork Tenderloin - only 5 ingredients! Pork, Ranch, Au Jus, butter and pepperonicni peppers. This is THE BEST pork tenderloin I've ever eaten!! The flavor is AMAZING!! Serve over grits, potatoes, rice or noodles. Also great on a bun. YUM! This is variation of one of our favorite pot roast recipes. It is SO easy and it tastes great. I think this might be my favorite version yet! I seriously couldn’t get enough of the flavors in this pork. 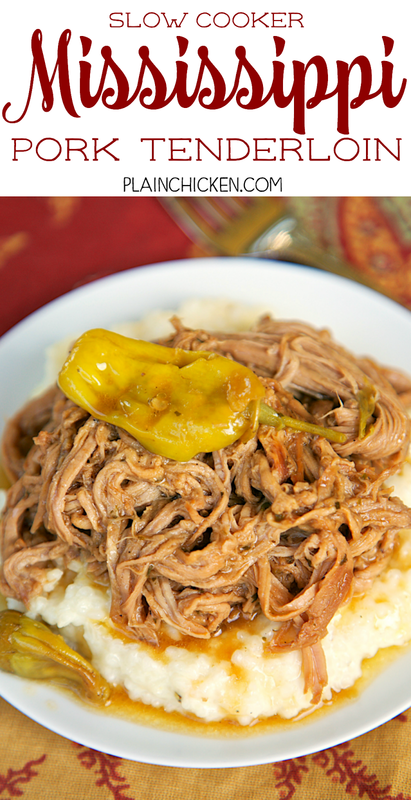 We served the pork over some yummy rice grits. This would be great over mashed potatoes, rice or noodles too! The pork was just as delicious reheated the next day. Try it in a quesadilla, on top of a salad or on a slider bun. YUM!! I think the key to the recipe is adding a little pepperoncini pepper juice to the slow cooker. Despite the peppers and the pepper juice, this dish is NOT hot at all. Not a hint of heat. 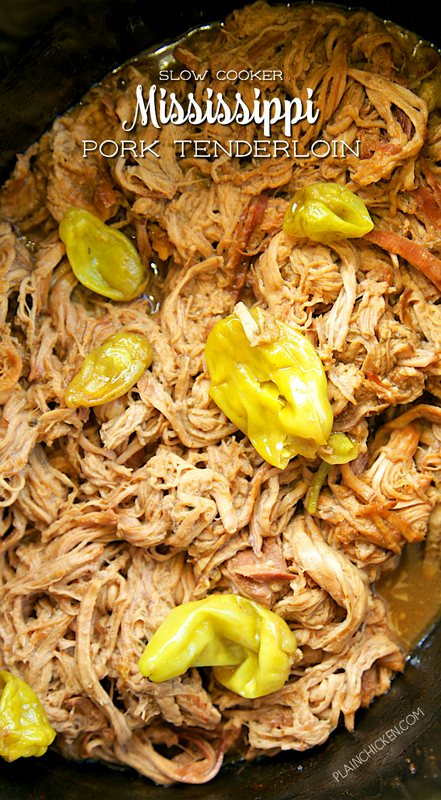 The peppers just add a sweet and tangy goodness to the pork. 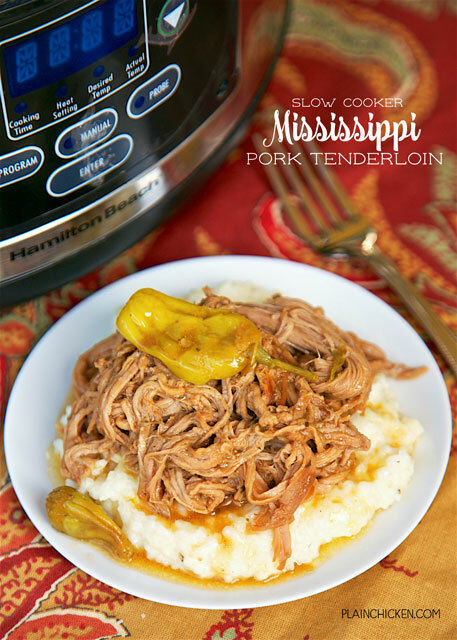 Writing this post has me craving this Slow Cooker Mississippi Pork Tenderloin! I know what is for dinner tomorrow!! This is in my slow cooker now!! It's sooooo good!! Is that 1/4 cup of the pepperoncini brine? Looks like a good alternative to the regular Mississippi Roast.